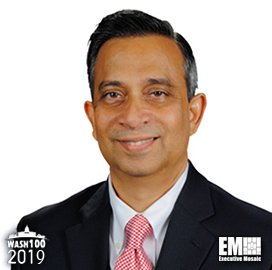 Executive Mosaic is honored to introduce Venkatapathi “PV” Puvvada, president of Unisys’ federal systems arm, as an inductee into the 2019 Wash100 — Executive Mosaic’s annual selection of the most influential voices in the government contracting arena — for his leadership and his efforts advancing IT modernization, acquisition, big data and cloud computing offerings. This marks Puvvada’s fifth Wash100 award in the last six years. Puvvada has been serving as president of the Unisys segment since 2014 after holding various roles at the company for over 22 years. In the position, Puvvada oversees the firm’s growth strategy in the federal sector and manages its portfolio of security, big data, mobile applications, unified communications and cloud computing offerings. As a regular contributor for Federal News Network and FCW, Puvvada is vocal on the issues involving the federal government’s information technology modernization and acquisition initiatives. In a December 2017 interview with Federal News Network, Puvvada noted that the government should take steps developing its program management workforce in line with its commitment to pursue a “bigger picture” for modernization. In another February 2018 interview with the news agency, Puvvada said there has been a recent increase in government interest towards the as-a-service business model. He added that federal contractors should integrate automation and related tools into their business models as a response to this growing interest. Speaking with ExecutiveBiz in January 2018, Puvvada discussed the importance of using a business-driven and risk-managed strategy for efforts to keep government systems up to date. He believes there is no “magic silver bullet” for solving IT modernization, and that program success depends on a good IT strategy and proactive communication between stakeholders. In addition to his duties at Unisys, Puvvada also serves on the Professional Services Council’s board of directors, working to support the national trade association’s federal contracting advocacies. Before that, he served as chair of the Industry Advisory Council focused on promoting IT advancement among government entities. Puvvada’s contributions have been recognized through numerous other industry awards over the course of his career, including four Federal Computer Week Federal 100 awards. Executive Mosaic also inducted him into the Washington 100, a group of industry leaders “who drive growth at the intersection of the public and private sectors,” in 2013. Executive Mosaic congratulates PV Puvvada and the Unisys team for receiving this award.